Christine Leaming transforms sugar into works of sweet art. Christine Leaming has always been artistic. Instead of paint or clay or other traditional materials, her chosen media these days are buttercream icing, fondant, modeling chocolate, food dyes and cake batter. Even so, many techniques that go into crafting Leaming's pastry masterpieces, made for her Spokane-based bakery Sweets Geeky Cakes, are the same as those she'd use when sculpting a lump of clay or brushing oil paint onto a canvas. Rather than a baker or a pastry chef, Leaming considers herself a cake artist. "I went to school for art, and was working coffee in the morning while going to school," she recalls. "One of the [pastry] decorators walked out, and they were like, 'Hey, you do sculpting, do you want to try?' ... It wasn't wonderful but I could do it, and I kind of surprised myself." Leaming has been crafting edible art from sugar, butter and flour for 13 years now, and through Sweets Geeky Cakes for the past three. 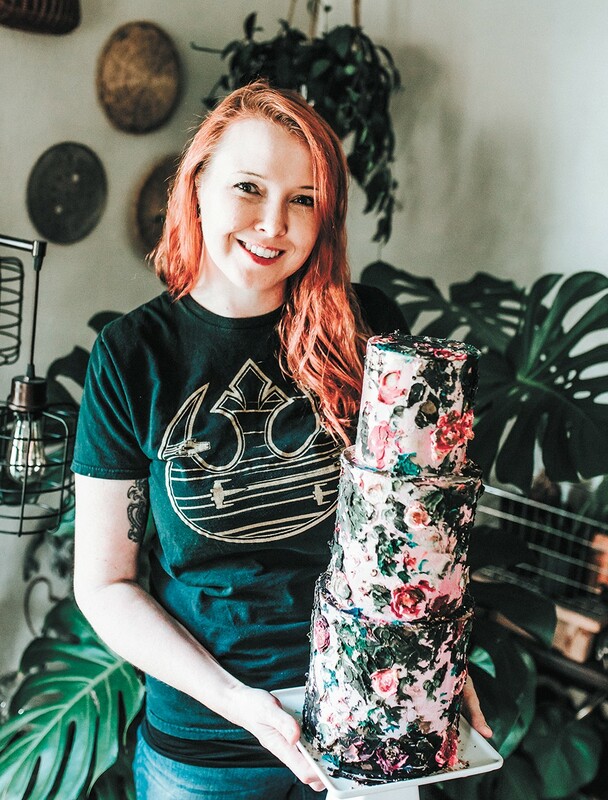 She bakes and decorates lots of kids' birthday cakes, often themed after popular video games, movies and other cultural trends — unicorns, kitties and llamas are also very popular, she notes — as well as tiered wedding cakes wrapped in elegant motifs and textures painted and sculpted in icing. She often uses sugar crystals to create geode-inspired designs, and marble patterns in frosting are a favorite, trending technique. 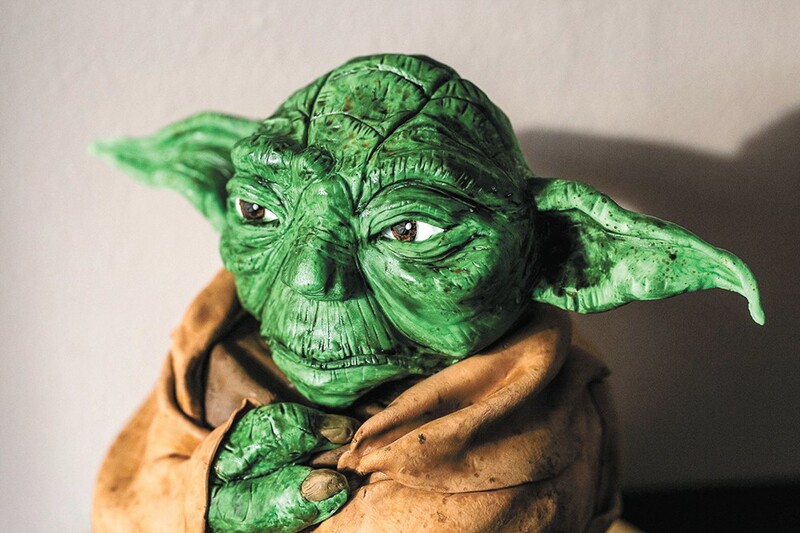 Yoda comes to life in sugar form for this sculpted cake. Sweets Geeky Cakes' elaborate work has been featured in numerous wedding and cake-decorating publications, both online and in print. Leaming's been invited to teach at industry conventions and aspires to travel and teach fellow artists around the world. "I've always been attracted to clay, and that is something I've been easily able to transform into edible art," she explains. "The other thing I do a lot is painterly — I take my palette knife set and transform that into my buttercream [tools]. I can sculpt and layer just like oil paint." Unlike clay or canvas, however, cakes can't be worked on and set aside to come back to later. "There's very little downtime because of freshness, which is huge. It doesn't matter what it looks like if it doesn't taste good," Leaming says. "That's something that's hard with sculpted cakes. Sometimes it doesn't go the way you planned, and if you're frustrated you can't walk away like with a clay sculpture." To speed up the process, Leaming usually bakes in the evening and freezes the cake overnight before waking up to stack and carve the layers into a base form she'll then cover with chocolate ganache, fondant and buttercream icing before perfecting her design. These expedited timelines also mean Leaming has to problem solve on the spot and is often under pressure to finish projects under tight deadlines. Most cakes are finished in less than two days, sometimes just one. "I have a lot of people when I deliver, they're like 'Oh my gosh, this must have taken forever!' and I just kinda laugh. The procrastinator in me is like 'Yeah, you'd be surprised,'" she says. "I think that comes to having a passion for it." Some of Leaming's more elaborate cake creations include a 4-foot-tall sculpture of the comic book character Deadpool, made for 2017's Lilac City Comicon, among plenty of other pop and nerd culture-inspired cakes from franchises like Star Wars, Marvel, DC, Harry Potter, Disney and more. She's sculpted intricate cakes resembling Yoda, the tentacled face of Davy Jones from the second Pirates of the Caribbean movie and plenty of rotten-faced zombies. Leaming's personal passion for nerd and comic book pop culture is often showcased in her work, and is reflected in the "Geeky" part of her bakery's name. "Sweets" is a nickname from her husband, Ben, but also represents Leaming's own love of cake and all things sweet. 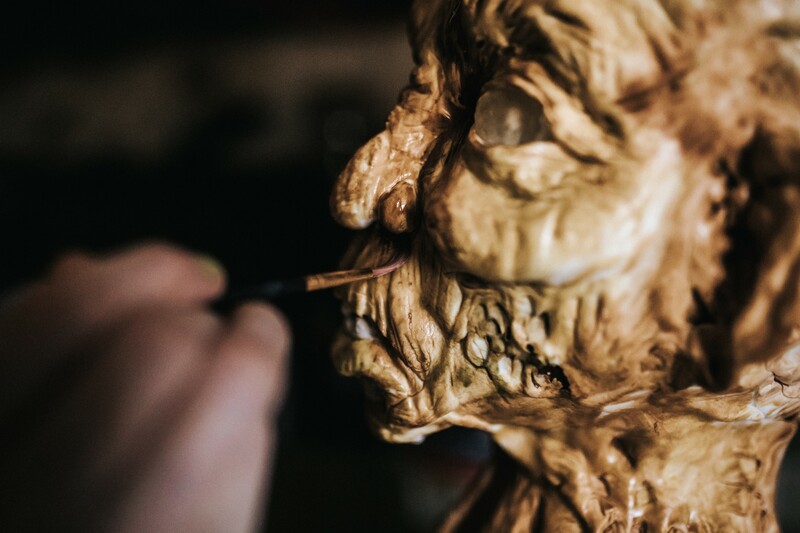 While she enjoys the challenge of sculpting lifelike representations of popular characters, Leaming also appreciates when clients allow her the freedom to innovate and experiment with an order. "My end goal is for people to bring me ideas and not photos. I want to build trust in my clients — they just give me an idea and it's an explosion of cake!" she says, laughing. Leaming also strives not to duplicate cake designs she's made in the past. "I want all my cakes to be my own, in a sense. I like to put my own spin on it, and I think that makes the client feel better — you've taken the time to make a cake for them, not just cranking something out like everyone else has." Beyond a custom visual look for her cakes, Leaming offers several flavor and filling options to customers, including her own recipe for a snickerdoodle custard filling, as well as traditional vanilla bean. Cake batter options are vanilla, chocolate, lemon, snickerdoodle, spice, strawberry and more, including seasonal flavors. Cake prices vary by design, with a minimum serving size of 15 people, starting at $4.50 per person and increasing based on design complexity. A single-tier unicorn cake, for example, ranges between $80 and $100, Leaming says. Sculpted cakes with detailed outer layer decorations (versus buttercream icing designs), start at $150 each. Still, Leaming says each cake varies by order requests, so it's hard to list base pricing. She prefers working with customers to figure out a vision that fits their budget. Most of Sweets Geeky Cakes' local following grew from word of mouth, since Leaming admits she doesn't spend much time marketing herself. She's the sole baker and cake artist, after all, working from her home kitchen, which is allowed by Washington state's cottage food industry laws. Still, Leaming hopes to keep it that way, both to maintain artistic freedom and so she can focus on raising her 4-year-old son, Jackson. To prevent overloading herself and getting burned out, Leaming limits how many orders she can take on each week. Find more of Christine Leaming's work for Sweets Geeky Cakes at facebook.com/bakedlife509. The original print version of this article was headlined "The Cake Master"